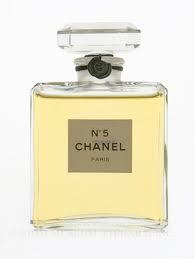 Chanel No.5 Perfume from a Tree? It’s the Ylang Ylang from Costa Rica! 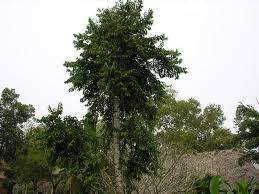 The Cananga Odorata tree is considered to be the true Chanel No.5 Perfume Tree. More often referred to by it’s common name, Ylang-Ylang…(pronounced “ee-lan ee-lan), it is among the most celebrated flowering trees in the World. Commonly found throughout Costa Rica, the Ylang Ylang tree is easily one of the most popular trees grown near or around “Tico” homes, as well as almost every Costa Rican Hotel or Resort in order to take advantage of its intoxicatingly rich floral fragrance. A fast-growing tree of the custard-apple family, growth can exceed an amazing 6-8 ft per year, attaining an average height of around 40 ft or so, with heights of some 140ft! The Ylang Ylang is happy in full or partial sun, but prefers the acidic soil native to its normal rainforest climates, but is known to adapt quite well to other conditions. The long slender leaves are smooth and glossy, pointed with a prominent drip tip, offering subtle drooping yellow star shaped “flower” clusters that yield a highly fragrant essential oil. Specimens typically bloom two times a year, though mature specimens are known to bloom almost continuously throughout the year. Flowers are very fragrant, with a greenish yellow color at first, turning to a deep yellow to yellow brown when mature. Its clusters of black fruit are also important food items for birds, bats, monkeys, squirrels and other small mammals that frequent the rainforest readily dispersing this non-invasive species of tree. This tree is commonly planted around personal gardens, as well as most Costa Rica Hotels will plant these around their installations so visiting guests get treated to their intoxicatingly rich scent. 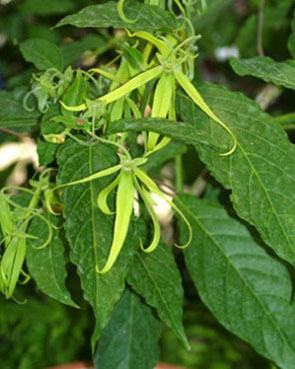 The ubiquitous Ylang Ylang tree offers multiple uses. The wood can be crafted or cut for canoe parts, small canoes, furniture, cooking fuel and cordage. The fragrant flowers are used to scent coconut oil, making lei and other decorative floral arrangements. 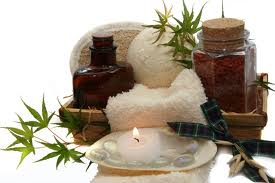 The essential oil of the Ylang-Ylang is used extensively in aromatherapy, where it is believed to relieve high blood pressure, normalize sebum secretion (the secretions that regulate skin, hair and inhibit bacterial growth), improve symptoms of depression, distressed breathing, high blood pressure, anxiety, and is considered in many parts of the World to be an aphrodisiac. 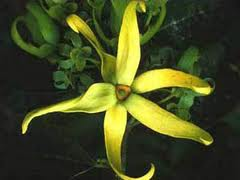 The oil derived from the Ylang-Ylang is widely used in perfumery for oriental and floral scented perfumes, the most famous being the wildly popular Chanel No. 5. Native to Indo-Malaysia, this tree has been widely introduced by Polynesians, Micronesians, and early European explorers into most of the Pacific islands. It was later introduced to Tropical America (e.g., Costa Rica and surrounding countries), where the species has thrived. The Ylang-Ylang is now found from the Mariana Islands (Saipan, Rota, Guam), Nauru, Caroline Islands (Palau, Koror, Faraulep, Chuuk, Pohnpei, Puluwat Atoll), to Fiji, Tonga, Samoa, Hawai‘i , and the Cook Islands and Marquesas Islands. 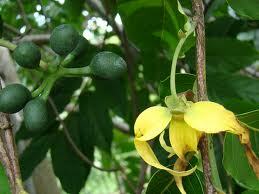 When considering growing your own Ylang-Ylang (which I highly recommend), it is most commonly propagated by seed. New trees can also be propagated by cuttings which requires a bit more luck and can result in varying degrees of success. Direct-seeding in the field is also effective in the right circumstances and conditions. The easiest method, and the one that I have personally had the most success with is to gently collect small specimens from under the existing trees and raise them in growing bags for 2–3 months before out planting the new starts. Remember to leave sufficient space for a deep taproot and tall wide growth for the mature trees. In summary, the appearance of the flowers of the Ylang-Ylang tree are not particularly impressive, but its powerful sweet fragrance makes this a must have in your garden. An early bloomer, its fast growth means you will see flowers when the tree is still relatively young. The branches are known to be brittle and break easily so protection from strong winds is recommended when picking a planting site. The Ylang Ylang likes the heat and will grow and bloom during the warm season, but fear not, as this hearty tree can survive low temperatures and even freezing for short periods of time. The later being something I sincerely hope does not happen any time soon in tropical Costa Rica! Juan Santamaría, an impoverished drummer boy, born of a single mother from the town of Alajuela, is easily the most famous martyr in Costa Rican history, and the only individual to have a National Holiday (April 11) declared in his honor. But was it really Juan Santamaria that saved the day at the Battle of Rivas, or was it more to do with Costa Rica’s need to have a national hero? Read on…. If legend is to be believed, as a result of the Battle of Rivas on April 11th, 1856, Juan Santamaria’s selfless act as his country’s impromptu savior brought his eventual rise to glory, fame and martyrdom as he succeeded in saving Costa Rica against the infamous US sponsored invasion of the soldier of fortune style militia of William Walker. William Walker, a lawyer, doctor and soldier of fortune from Tennessee, hoping to not only exploit the commercial trade route between New York and the Southern tip of Nicaragua, Walker also hoped to conquer the five Central American States with the intention to annex them, extending the new Federation of Southern States, part of the US. Walker and his “filibusteros” (soldiers of fortune) with his new post as a shaky provisional President of Nicaragua planned to instill his political and financial power over the Central American territories, with the next logical step being the invasion of nearby Costa Rica. Fearing Walker’s growing force in Nicaragua, Costa Rican President Juan Rafael Mora supported by the backing of wealthy American businessmen who wanted their important trading routes reopened, was urged to declare war not on Nicaragua, but on Walker and his filibusters. Furious, Walker ordered the immediate invasion of Costa Rica, crossing the border into the province of Guanacaste, while the Costa Rican army mobilized full speed ahead Northward from the Central Valley. 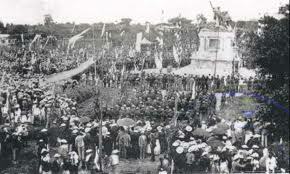 This rag tag army, led by the President’s brother Jose Joaquin Mora and brother-in-law General Jose Cañas, with their contingent of three thousand men marched towards the Walker encampment said to be assembled near the now famous Hacienda Santa Rosa, south of Nicaragua. Upon learning of their imminent arrival, Walkers men made a hasty retreat, taking the battle to Meson de Guerra in Rivas. That is where Juan Santamaría prominently steps into the picture. Walker’s men, under the command of Colonel Louis Schlessinger, had no sentries posted in the Rivas fort, allowing Mora’s Costa Rican troops to surprise the small American militia, as Schlessinger himself retreated, leaving his troops in complete disarray. 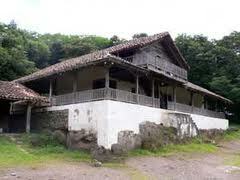 When a bloody battle ensued, the commanding Costa Rican officer asked for a volunteer to set fire to thatch roof of the El Mesón de Guerra; the filibusters’ stronghold. Surely a suicide mission at best, it is said that Juan Santamaría, an impoverished mulatto drummer boy from the town of Alajuela, stepped up and with torch in hand, approached the hostel and through a hail of bullets, tossed his torch of fire onto the vulnerable thatched roof. This selfless patriotic act caused the enemy to flee, resulting in Juan Santamaria’s death, but leaving him a genuine National Hero. The deaths of Juan Santamaría and more than a thousand other men saved Costa Rica and Central America from a complete collapse. The Battle of Rivas put great confidence to the Costa Rican Army in the fight against Walker, who before this battle believed himself undefeatable and unstoppable, and lead to his later assassination in Honduras, during his next attempt at staging a Central American coup. Although Costa Rica was victorious in the Battle of Rivas, the country did not return back to normal by any means. The numerous dead bodies were not buried in Rivas but were simply thrown into the wells, causing the city a huge outbreak of cholera from the contamination. The troops then carried the disease home with them to Costa Rica where it ravaged the country, killing as much as one tenth of the population. Mora was eventually blamed for the outbreak, as well as other economic problems, and was taken out of power a few years later in 1859.
century was seeking to create a national identity in order to unify the disorganized country. Legends, heroes and battles, all helpful ingredients in the creation of a sense of national patriotism, the government set out to find something or someone that would serve its motivating purpose. Since Costa Rica lacks a history of warfare, the Liberalist government chose one of the few significant battles, the 1856 Battle of Rivas fought against William Walker. After choosing the famous battle, a brave hero was to be chosen as their new “symbol” for National unity. With this, Palmer says, Juan Santamaria was “born” or reborn after being dead and forgotten for many decades. That Juan Santamaria was a member of the lower classes, only served to inspire an even stronger sense of belonging to a nation that was coming of its own in world recognition, as Juan Santamaria showed anyone could become a National idol. Further claims have been discovered that state Juan Santamaria actually died of cholera and not by the bullets of his enemies. Now granted, there are said to be listed four different Juan Santamarias amongst the some 9000 volunteer troops of Costa Rica, so this does open the door for some skepticism and confusion, but it is interesting to consider why Juan Santamaria lay buried for almost four decades, before being remembered and named Costa Rica’s National Hero. Finally, other historical versions of the Battle of Rivas and the fight at the “Mesón de Guerra”, list the Lieutenant Luis Pacheco Bertora as the first to approach the fort with the idea of flushing out the enemy, but he was gravely injured by gunfire in his attempts. Lying unconscious, a Nicaraguan named Joaquín Rosales made a second attempt to burn the fort, but lost his life in the process. Finally, a third brave soldier stepped forward, the now well-known Costa Rican soldier, Juan Santamaría, who successfully set fire to the “meson” and saved the day for Costa Rica. None of these other brave soldiers have ever received the recognition due them as Juan Santamaria did, much less a National Holiday, statues or International Airports named after them, though the mystery behind the true history of these events lives on! In the end, there is no attempt to minimize the participation of any of the soldiers involved in this battle, even less so Juan Santamaria. 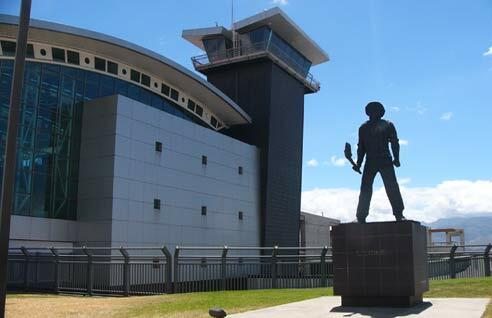 We only hope to give a shout out to all the valiant soldiers who gave their lives to win the liberty and sovereignty of Costa Rica, and to dispel of the rumor that Juan Santamaria was simply approaching the building, tripped and his fire torch accidentally started the fire that ended the battle. Tell that later version out loud in Costa Rica, and you may be run out of the country even faster than William Walker was! !